A kazan is a type of cooking pot similar to a dutch oven in function, and resembling a wok in form. The kazan is an extremely versatile piece of cooking equipment, and can be used for frying, grilling, boiling, simmering, steaming, and even baking. The kazan is used for cooking throughout Central Asia and Turkic regions (e.g. Tatarstan, Xinjiang), and is as important to Central Asian cuisine as the wok is to Chinese cuisine. Traditionally, kazans were made from cast iron and suspended over an open wood fire outdoors. 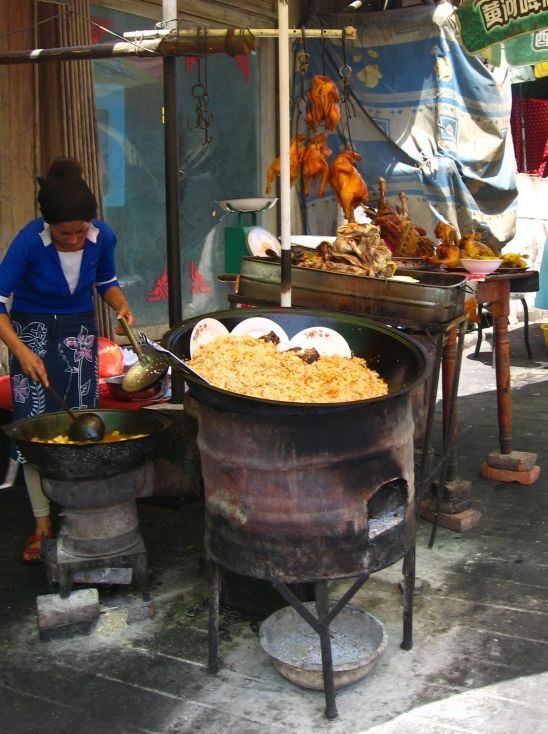 In Central Asia people often still cook this way, for example, when making a huge amount of plov for many people. Most of the recipes on this site are from Central Asia and are best prepared in a kazan, although for some recipes a wok or ordinary cooking pan will do. For plov, a kazan is absolutely essential. What kind of kazan should I buy? You can buy cast iron and aluminum kazans. While cast iron is more traditional, for cooking at home over a gas or electric stove, an aluminum kazan will be more practical. As Stalic explains in this post (in Russian), aluminum cookware has many desirable properties, chiefly its high thermal conductivity: an aluminum pan will heat up more quickly and evenly than a cast iron pan. Aluminum kazans are also much lighter – a cast iron 6-liter kazan will weigh almost 20 pounds, while an aluminum kazan of the same size weighs less than 5 pounds. Kazans come in many different shapes, ranging from wok-like half-spheres to basically casserole pots. If possible, you should pick a kazan that has round walls, and a flat bottom if you are cooking on a stovetop (or buy a wok stand for a round-bottomed kazan). Make sure that the kazan is sold with a lid, as a heavy, tight-fitting lid is crucial to many recipes. I have a 6-liter, aluminum kazan with round walls and a flat bottom. It’s made by Kukmara company in Russia. With this size of kazan you can cook plov for 5-6 people. You will also need a spatula/skimmer to cook in the kazan – you should look for a round spatula with a slight curve to it, as you will find it awkward to move things around in the round kazan with a typical flat spatula. Such spatulas are often sold in Chinese stores, or you can buy one from this store. Where do I buy a kazan in the US? In the US we actually have surprisingly many choices for buying kazans or similar cookware. 1) Online: You can buy kazans from this EBay seller who ships from the US, and even on Amazon. If you search for “kazan” on EBay and Etsy you can find other sellers as well. 2) Russian or Central Asian stores: In New York, there are stores in Brooklyn and Queens that sell kazans. I bought my kazan at the grocery store Фортуна(“Fortuna”) in Borough Park (called “Gala Apple” for some reason on Google Maps, but Фортуна is what you will see on the store), where they sell a wide variety of aluminum and cast iron kazans, and even mangals (for barbecue) and manti steamers. 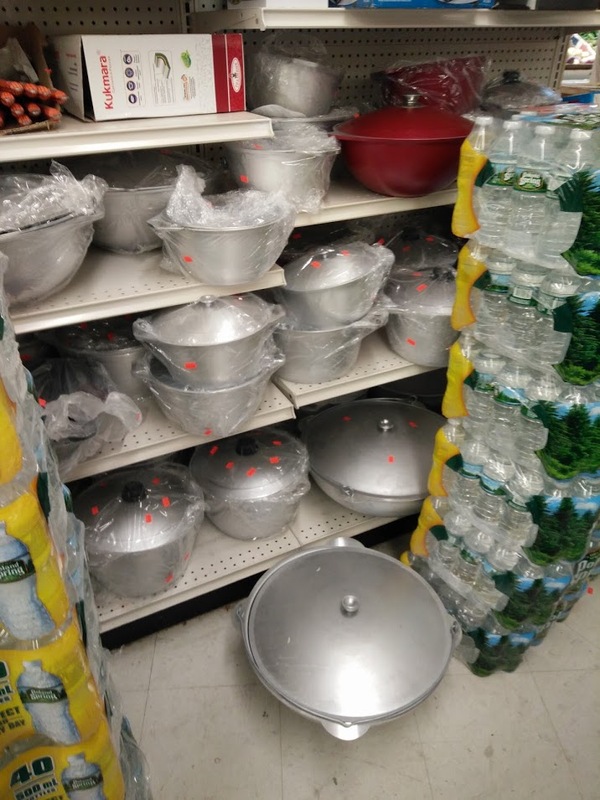 Russian/Central Asian stores in Rego Park sell kazans too – try NetCost and Queens Bazaar Food. 3) Dutch oven / Jambalaya pot: Many people simply use cast iron dutch ovens instead of kazans, and while I haven’t tried them personally, I hear they cook plov just as well as Uzbek kazans. The Lodge dutch ovens are often recommended, and you can even see them in a few photos from Stalic Khankishiev’s books. You can also find “Jambalaya Pots” online which very closely resemble kazans in form and function. How is a kazan different from other cooking tools? Do I really need one? For a long time, I used a flat-bottomed cast iron wok before buying a kazan. I would often have problems with the food burning on the bottom, and some dishes never turned out exactly like I wanted. Once I got a kazan, everything magically worked! 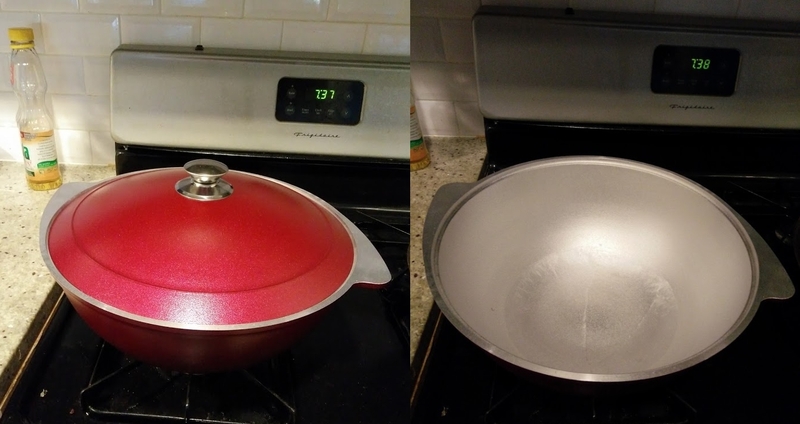 It turns out kazans are actually quite different from woks, despite looking similar. The primary difference is that kazans have very thick walls. They distribute the heat more evenly throughout the walls and interior (as opposed to a wok, which will only get hot on the bottom and can actually be quite cool on the walls). Kazans are usually sold with a heavy, tight-fitting lid, which is crucial for dishes that involve steaming, such as plov or dimlama. If you know of other places to buy kazans for people living outside of Russia/former Soviet Union countries, please leave a comment! Greetings, and Thank You! for a most excellent post on making plov. I have a 12l Kazan and when researching plov came across Stalics’s video (Stalic Khankishiev (video here) https://www.youtube.com/watch?v=MQbypf8nFn0 sure wish I could understand Russian. In his video he is cooking in a Kazan on top of a portable stainless steel oven. I am looking for that oven. Do you have any leads or contacts as to where one of these may be obtained, even if I have to import it myself. They are selling some steel wood-fired ovens that could be used for the same purpose. Thanks, I have one of the round sheet metal ovens and was looking for something a little spiffier. Stalic’s oven with a flue looked like it might be a bit more controllable. Hopefully somebody from Russia will see this and offer a suggestion. Have a look at these sites. If you contact them, maybe you could work out shipping an oven to the US – let me know how it goes if you do! In general, search for печь для казана (oven for kazan). Working my way through the article using Google translate, it is the log of his drive to Germany to pick up his new oven from: http://www.schaschlikgrill.de/ Here is the page for the oven: http://www.schaschlikgrill.de/kasan.html This really is exactly what I am looking for, it appears to be a high quality double walled insulated oven. It looks now that I will have to contact the company (hopefully somebody speaks English) and see if it would be possible to get the oven shipped to the USA. Thanks again, this has been fun! Larry, were you able to have it shipped to the USA? I am in NYC and also interest in getting one. Thx. I have not followed through on contacting the company that makes this Kazan oven. The covered outdoor cooking area which it would inhabit has not been completed, and I am unwilling to let it sit out in the weather. That said, after this prod, when I get some free time, I will attempt to contact the manufacturer and at least begin the dialog. Other than the oven being heavy, which makes final delivery a pain, I can’t see a problem getting it shipped to the USA, especially the east coast. I am a good bit further away which adds to the logistics and shipping cost. Hi Pravit – thanks for your detailed post. It has inspired me to purchase a Kazan. I know with woks before using it, one should season the wok. Is there any preparation necessary for the kazan before I start using it? Hi Sami, if it’s made out of cast iron, then you should season it to develop the patina; otherwise, it’s not really necessary.